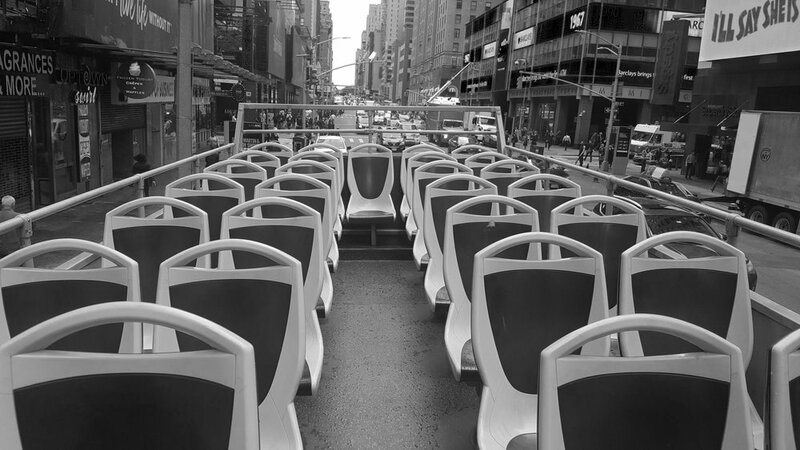 Take the Walking Tour and Send 400 YEARS to 42nd Street! Like most artists, I've had a lot of day jobs. 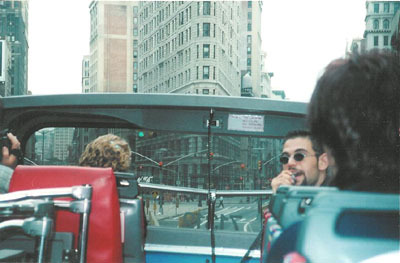 But none has impacted me more than my long experience as a New York City Tour Guide. The bulk of my tour-guiding career took place between 1998 and 2007, but I've done it as recently as 2018, and at this point I must concede that it could happen again at any time. 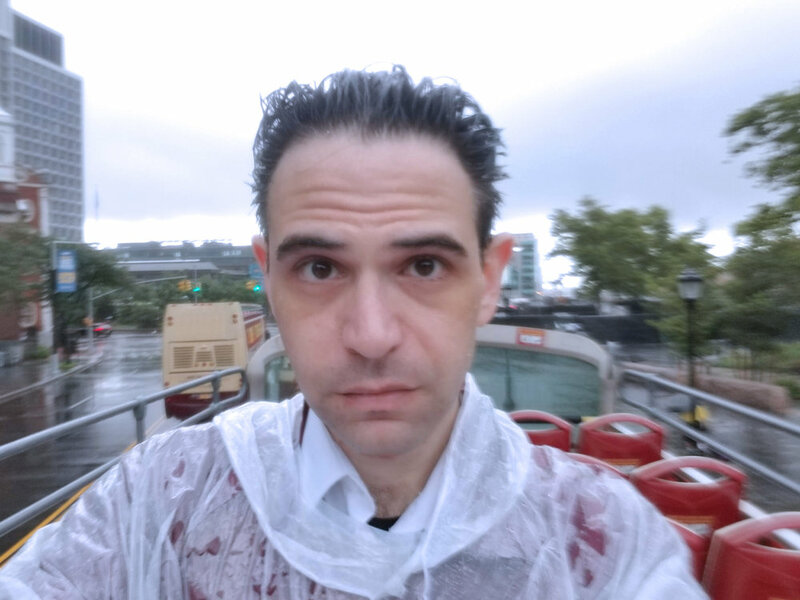 Every so often I just wake up on a double-decker bus with a microphone in my hand, no matter how hard I try not to. During my early tour guide adventures (under the auspices of the now-defunct, much-reviled New York Apple Tours), while flying through the city and freestyling narration into a microphone, I often thought: What I’m really doing here is developing material for a solo show. 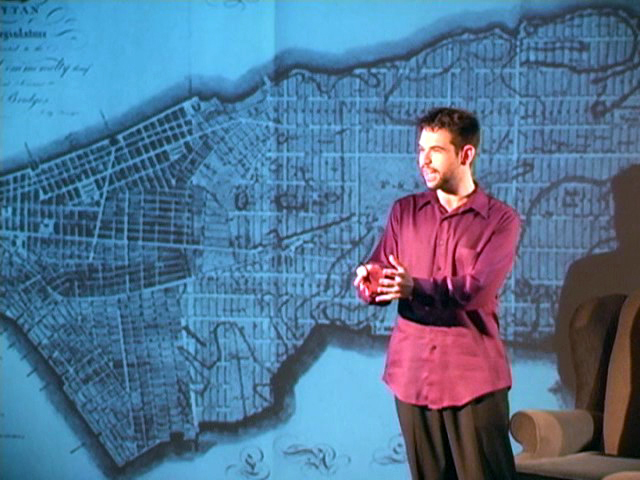 The initial result of that thought, 400 Years in Manhattan: A Tour Guide's History, was first seen in a workshop production at HERE Arts Center in 2007. Directed by Amanda Sisk, the show combined the city's history with my experiences telling its story, accompanied by a multimedia presentation which allowed the audience to watch Manhattan change over the course of four centuries, in ninety minutes. It went well, but a planned commercial run fell through, and other projects came along, and 400 Years has remained "something to get back to one of these days." In 2016, the New York Public Library released its priceless archive of over 180,000 public domain images, including a vast collection of photographs, artwork, maps, documents, and artifacts from the city’s past. Sifting through the treasures, all I wanted to do was revamp the visuals which accompany 400 Years in Manhattan, drawing on the bounty of the NYPL archive, as well as the multimedia tools of 2018. Last year, for five months of weekends, I went back to the buses! It had been years since tour-guiding had found its way into my ongoing shuffle of jobs and projects. Returning to the grind stimulated my thinking about the text of 400 Years in Manhattan, and what a new version would be like. The city has changed, and so have I, and we both have different stories to tell. Rewriting the monologue has further convinced me that the time for 400 Years in Manhattan has come. In 2007, it played as a post-9/11 reminder of the city’s resilience. In 2019, it’s as much a reminder not to take resilience for granted, that history is still happening and its outcome depends on our participation. The harbor and Manhattan, seen from Staten Island. Drawing by Joseph Hamilton, 1849. Colored by Noah Diamond, 2018. "400 Years in Manhattan is the most fun you can have touring this amazing island that we live and work on without having to board a bus, helicopter, or boat. 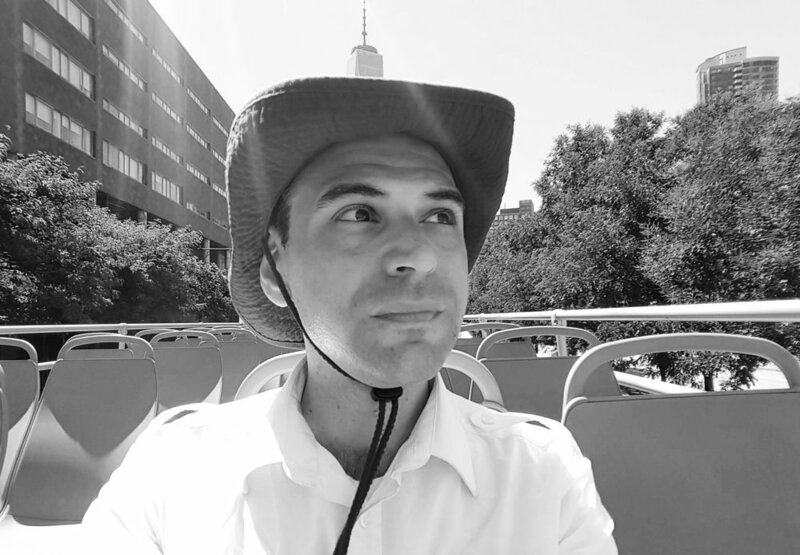 Noah Diamond has put together a delightful and fascinating one-man show that relates his own experiences working as a tour guide as well as precisely what the title promises, i.e., a panoramic and engaging journey through the history of Manhattan. "This show is a feast of little-known history that's right under our noses... But it's more than just a treasure trove of arcana: it's a thoughtfully constructed one-man play, built from personal reminiscences along with the straight-up history. Diamond's performance is likable and good-humored; his writing is unfailingly intelligent, often quite funny, and sometimes authentically profound and wise. The presentation that Diamond and director Amanda Sisk have provided for the show is outstanding — perhaps the most effective use of multimedia I've yet seen in the theatre. "It is, all in all, an evening that's thoroughly enlightening and entertaining — precisely what one hopes theatre will always be. 400 Years in Manhattan was one of the best times I've had in the theatre in quite a while." 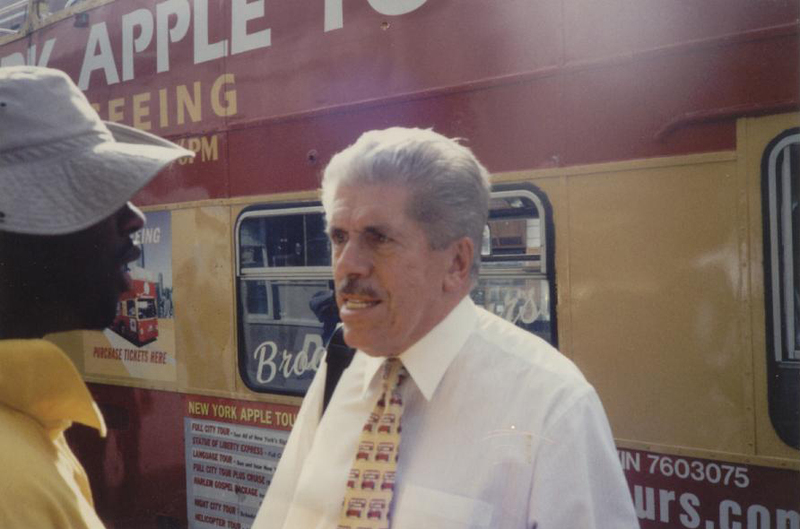 The bad old, good old days of New York Apple Tours in the 1990s. at the Apple terminal on 53rd Street and Eighth Avenue, circa 1998. Photo by Randy Black. 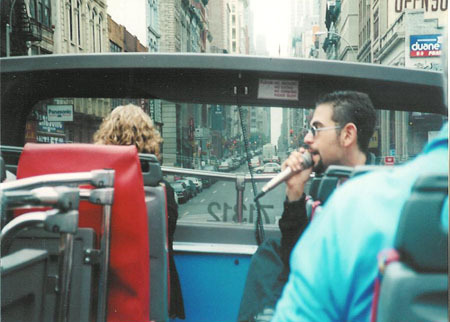 Here’s an earlier version of me — singing my song for Gray Line New York Tours, 2001. Photo by Shayna Diamond. Narrating boat tours for New York Waterway, 2005. Performing in the original workshop production of 400 Years in Manhattan, HERE Arts Center, 2007. Workshop production of 400 Years in Manhattan, HERE Arts Center, 2007.